If you’re one of those bloggers who always love to customize and modify their blog with some advanced widget then this tutorial is for you. WordPress blog can be easily re designed using hundreds of plugins, just download and activate the plugin and you’re done. No need to write those bulky codes as they can major roadblocks for your website. But this functionally is not supported on blogger. You’ll have to provide the support of scripts to make your blog stand properly. Login into blogger dashboard with your user name and password. Copy & paste the following code into text field. Replace www.crunchytricks.com in the above script with your website URL. Then click on Save button. That’s it. 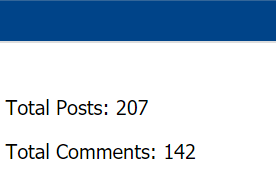 So I think now you can easily display total published posts and comments of your blog. Still having any doubt? feel free to leave a comment below in the comment section.